SIRAHA, July 24: In 2011, the foundation stone laid for the construction of a bridges over Kamala and Balan rivers offered a huge respite to the locals of Saptari, Siraha and Dhanusha. This bridge was expected to speed up the development process of the region. The locals were elated as they were finally about to realize their dreams which remained unfulfilled since the Rana regime. With the beginning of construction work in 2011, people started counting days when they would be able to shorten their distance to the Postal Highway through the bridges. But they are tired of waiting to realize their dream as the bridges have not been constructed even in eight years. The bridge over Kamala River can ensure faster connection between Siraha and Dhanusha for the people living in both districts. As per the contract, the bridge should have been completed by mid-December 2014, but the deadline kept extending. The work has not gained much pace despite extending deadlines twice. Manoj Kumar Mandal, engineer of Postal Highway's Planning Directorate informed that Pappu/Lumbini JV Kathmandu was awarded with the contract for constructing the 470-meter long bridge over Kamala River. A total of Rs 281 million was sanctioned for the project. According to engineer Mandal, the negligence of contractors is the reason behind the delay. Even after so many years, only 50% of the work has been completed so far. Similarly, the construction of Balan Bridge too has been abandoned halfway. This bridge will connect Siraha and Saptari with the Postal Highway. Sharma Pappu JV had signed the contract to construct this bridge on February 27, 2012 promising to complete the 470 meters long bridge by August 31, 2015. 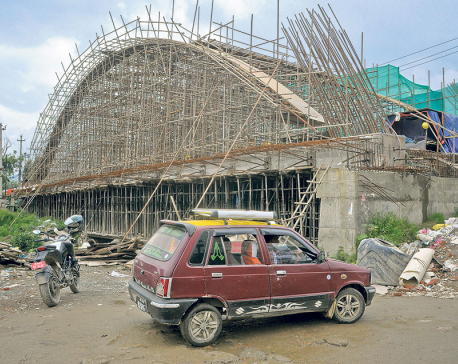 Despite spending years, the project which was signed for Rs 246 million is showing no signs of completion anytime soon. This project too has extended deadlines twice. The construction of this bridge was started with the design introduced some ten years ago. But now, the river has river has changed its course and become even wider adding challenges for the project. The sluggish construction of two major bridges along the Postal Highway which is often considered the lifeline of Madhes has directly affected the development of the region. As the Kamala Bridge is under construction, locals of Siraha and Dhanusha are obliged to use boats for crossing 1200 meters to reach the other side of the river. But the changing course and rising level of water in the river has threatened their safety of late. Five years ago, seven people had died when their boat flipped after a flood in Kamala River. Siraha is the main market for the people living in various parts of Dhanusha. It is a compulsion for all of them to use boat to reach there to buy things. "We don't have any problem crossing the river in boats during summer but it is quiet unsafe in monsoon," said Sakina Khatun of Saghara, Dhanusha, adding, "We won't have to go through this ordeal once the bridge is constructed." The completion of both these bridges could be a milestone in the development of Madhes, says Kishori Yadav, an intellect of Siraha. "As the Postal Highway area is attached to the Indian border, completion of these bridges could help the locals to reach out to various markets with their products. Hence, it can work wonders for them," said Yadav. What delayed the construction of Nepal's first arc bridges?